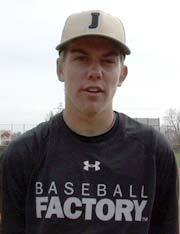 The path to collegiate baseball has been lined with highs and lows for Baseball Factory athlete, Tyler Ingram. The low for Tyler and his family was especially tough, as his father, Corey, developed a deadly liver condition in the summer of 2017 that nearly took his life. Athletes experience challenging lows before things improve, but it’s how Ingram pushed through trying times, making it all the more rewarding for the 2019 grad, as he recently committed to play for Division III Trine University in Angola, Indiana. Since joining the Factory in early 2017, Tyler has been an athlete who embodies the Factory Way. Overcoming odds, scratching and clawing their way to their dream. It all began at his first event, a Baseball Factory College PREP event at the University of Indianapolis in March of 2017. 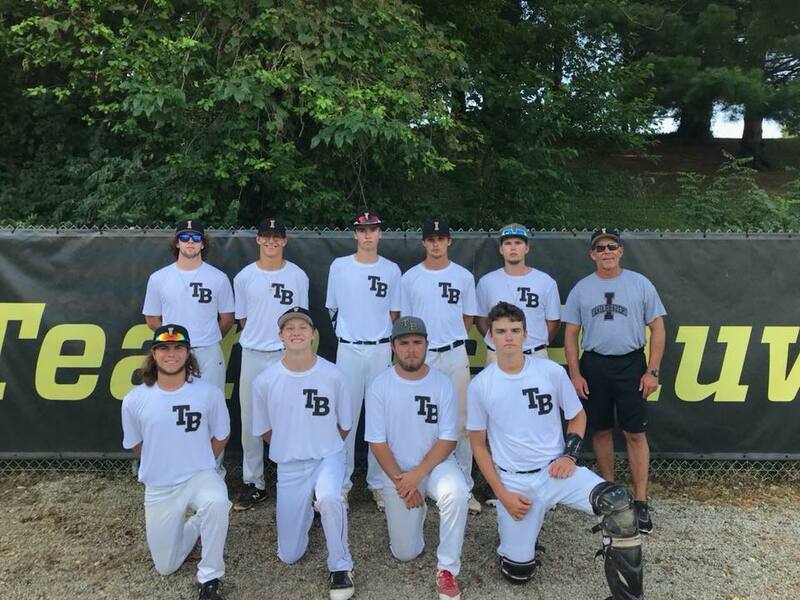 Tyler quickly warmed up and enjoyed Baseball Factory’s coaching staff as they showed a genuine interest in wanting to help Tyler grow as an athlete. Shortly after, he came into contact with Player Development Coordinator, Corson Fidler for the first time. 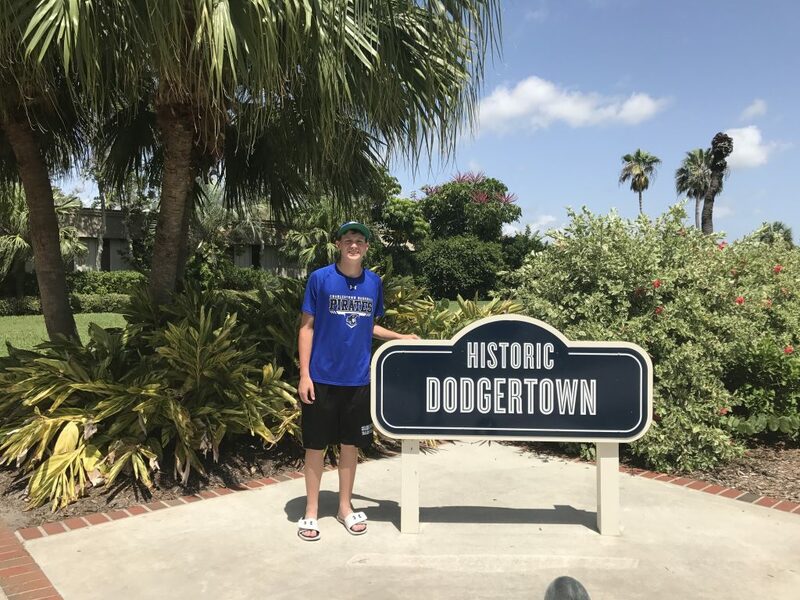 Ingram at Historic Dodgertown during Baseball Factory’s Pro Select Training event. Corey noted that both Corson and the Factory showed an immediate and genuine interest in Tyler. With an action plan in place and an invitation to Baseball Factory’s Pro Select Training in Historic Dodgertown later that summer, Tyler began to prepare. In early April, however, a visit by Corey to the doctor led the family to unexpected news. Corey began having liver issues and by July, was hospitalized with a prognosis of six months to a year to live if a liver transplant was not available. For Tyler, who shares special bonds with his Dad through the game of baseball and mom, Brandi in day to day life, blocked out the negatives and focused on the positives. Tyler continued driving forward despite the scary unknowns with Corey’s health. Ingram (bottom row, second to left) with his Indiana Trailblazer teammates. His talent led him to be selected for the Under Armour Recruiting Classic last December in Arizona. Balancing baseball with life was proving difficult, and the family nearly declined the invite, as Corey’s treatments began to ramp up. Looking to help in any way possible, the Factory Foundation, charitable arm of Factory Athletics, worked to get Tyler and the Ingram’s what they needed to make sure he was on the field. Tyler thrived in Arizona, rejuvenated by playing the sport he loved. Using drills and recommendations on improvements he could make immediately to his game from Corson, Tyler followed a long toss program that helped increase – by his estimates – his throwing velocity by nearly 10 miles per hour and bat speed by six. The improvement that summer got the attention of coaches Troy Whittington and Josh Goldspiel with the Indiana Trailblazers, a summer team in Bloomington, Indiana, who both saw Ingram’s Baseball Factory videos and knew he would be a big part of the program. Both were supportive and instrumental in Tyler’s development. Tyler and his parents turned their attention to the college recruiting process as he began to build his college list. 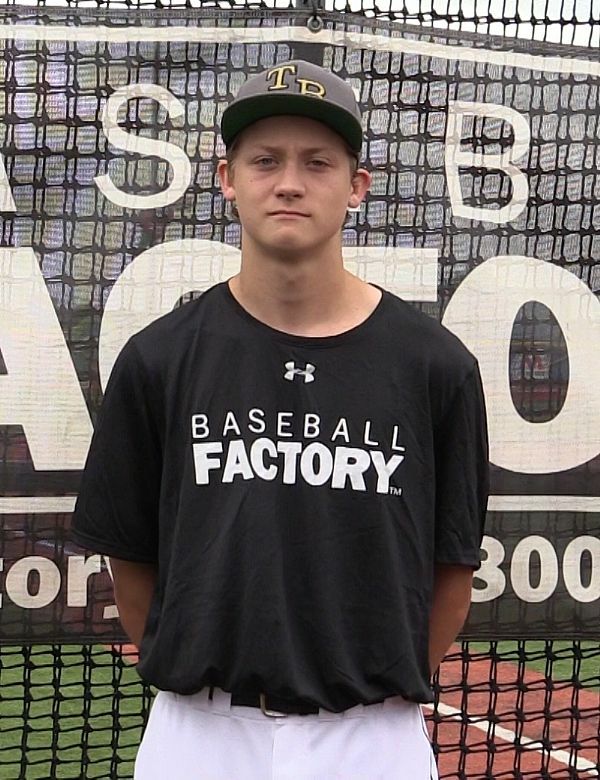 Having a Baseball Factory player web page with his numbers, scouting report and video from his previous College PREP events and the Recruiting Classic, Tyler began the search for his school. Trine University came calling, but initially reached out to Tyler for bowling. After the call from the bowling coach, Tyler took it upon himself to research Trine and decided to email the link of his player page to the baseball coaches. Planning to study psychology, he met the head of the department and clicked immediately. Pleased with the state of campus, noting the state-of-the-art facilities: the dorms, classrooms and library, to the baseball field and athletic facilities, it was an easy decision. 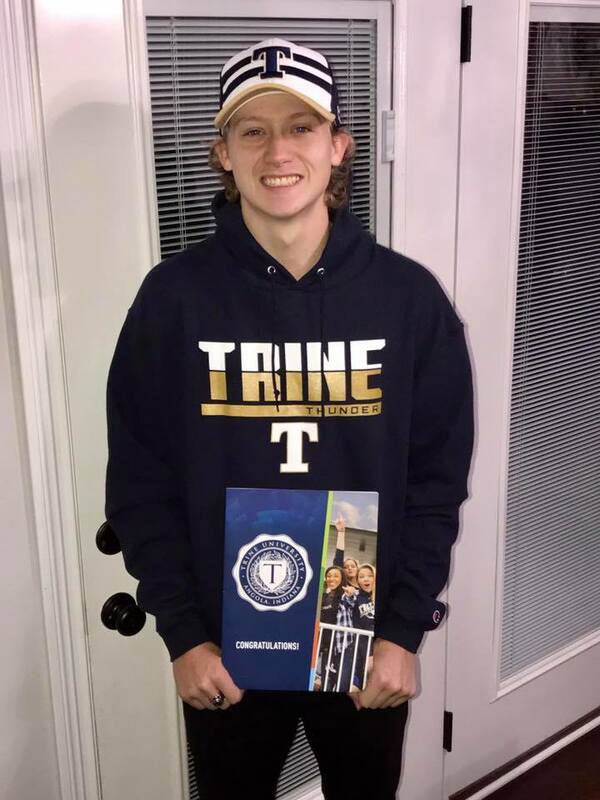 Ingram, after committing to play at Trine University. Neither Brandi nor Corey played collegiate sports, so the process of getting Tyler started on his journey was a brand new and often eye-opening experience, one made much easier once the family met head coach Greg Perschke. This proved instrumental in Tyler’s recruitment as the video from the Recruiting Classic gave the coaching staff all they needed. The video helped to show Tyler’s strengths, easily translating how Tyler could fit into the plans at Trine. It just happened to be the first time they were seeing Tyler’s play. “They were so impressed with how well he played on his videos, especially in his live game pitching video from Arizona, that they knew they wanted him on their team,” Brandi said. The true, meaningful connection and level of comfort the Ingram family felt with Fidler, far surpasses anything that happened on the field. Corson noted how so many odds were stacked against Tyler, but one by one, he fought on. Focusing on the field isn’t easy, but it’s even harder to keep focus in the classroom. Despite all the hardships, Tyler continues to thrive and keep focused. Brandi noted the importance of academics, discussed by Factory coaches during the events Tyler attended. Corey’s health continues to improve as the normalcy slowly returns for Tyler. If it weren’t for that day in March of 2017 when Corey took the chance, driving Tyler nearly 100 miles from their home in Henryville, IN to the University of Indianapolis, it was likely Tyler wouldn’t have realized his dream of playing collegiate baseball. And now, Corey gets a second chance at life, happy to see his son take on the next chapter.